So, no discernible progress on the job front, but people, I got up at 7 AM yesterday and went to the gym. Not only that, but I've in fact been to the gym every other day since I stated it as one of my goals a week ago. I mean, granted, that means I've now been to the gym five times total this calendar year, but I still feel that's an improvement over zero times. In other goal-fulfilling news, long time readers might recall a pledge I made last year, to witness the full glory that is Rolling Thunder. The magical day was May 30th, and as it was supposed to hit 90 degrees, The Pit and I originally planned to take a short walk to an overpass and look at the motorcycles streaming by beneath us on the highway. We were almost out of the house before we realized that the overpass closest to our house is actually an underpass, and would therefore provide little in the way of viewing pleasure. 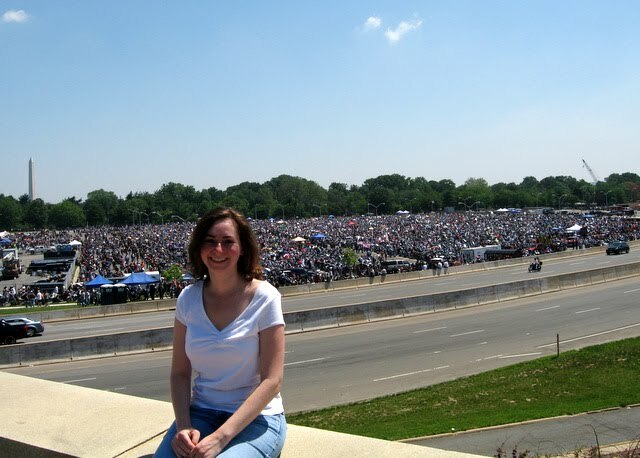 At that point, there was nothing to it but to hoof down to the Pentagon (2.5 miles away) and view the entire assembled throng in person. The walk there was hot but bearable, and you can see me holding up quite well in the following picture. 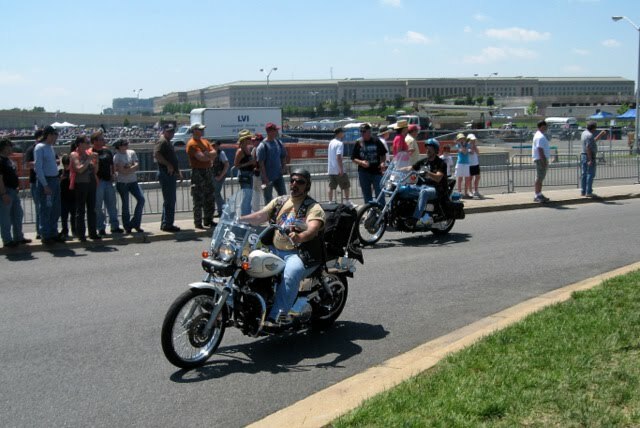 Assembled behind me in one of the Pentagon parking lots are approximately 30,000 riders and motorcycles. Sadly I chickened out and didn't ask for pictures with any of the really picturesque specimens wandering around, but be assured there was plenty of leather, bandannas, facial hair, metal studs, and mullets in evidence. Also a fair number of cowboy hats, and I witnessed one dude strolling around in really awesome fringed leather chaps. How these people managed to survive the heat of the day wearing so very many layers of denim and leather is still puzzling to me. I mean, I wanted to die walking back home, and in fact presented such an alarming sight that passersby kept offering me water and/or sunscreen. I grew tired of explaining that it wasn't sunburn, just the normal tomato red color of my face when I'm feeling a wee bit exerted. Bringing this post full circle, I'll reveal that my face turns this color not just when I'm about to collapse of heatstroke, but also after approximately 10 minutes spent exercising. I was not built for such strenuous physical activities, but I shall attempt to persevere.